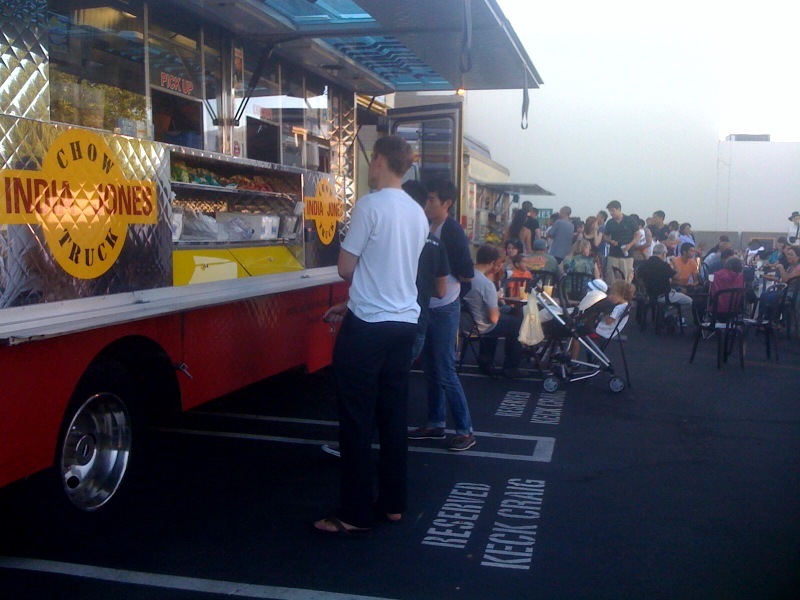 I am proud to say that I have, in fact, met and exceeded my previous record for number of LA food trucks visited in one trip to SoCal. 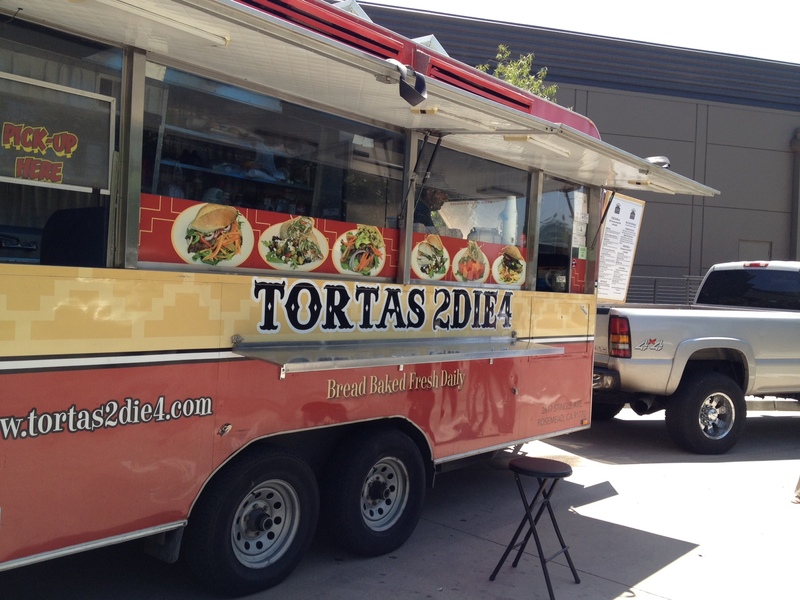 Last time, when I was here for over two weeks, I went to eleven trucks. As of last night, I’ve been to twelve on this trip, which has only been just over a week. Go me! 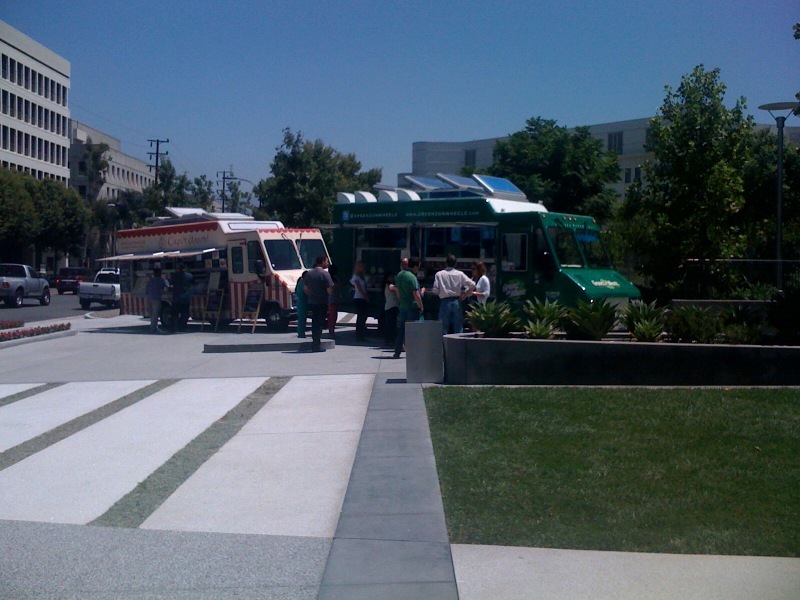 Yesterday I headed to Burbank once again to hit up two trucks that were parked together, Crepe’n Around and Greenz on Wheelz. These were two trucks I had definitely been seeking out. 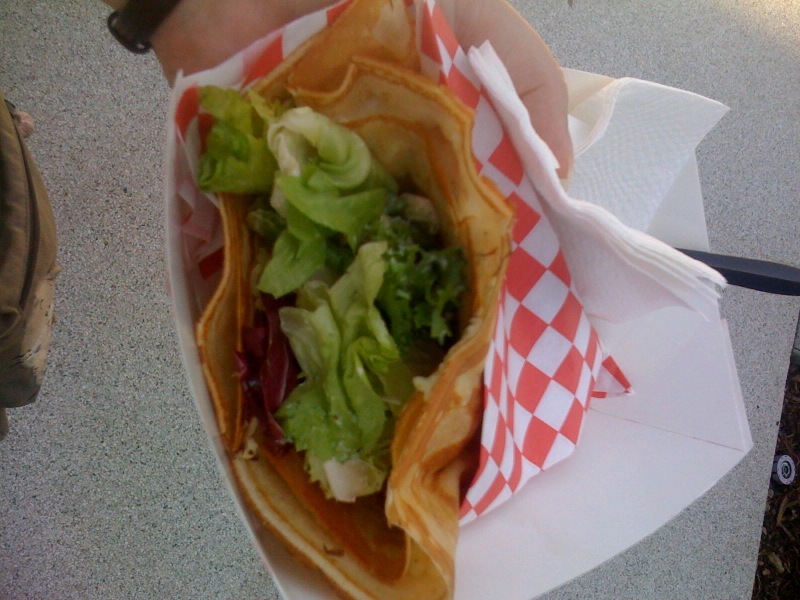 I love crepes, and I love love love salad. 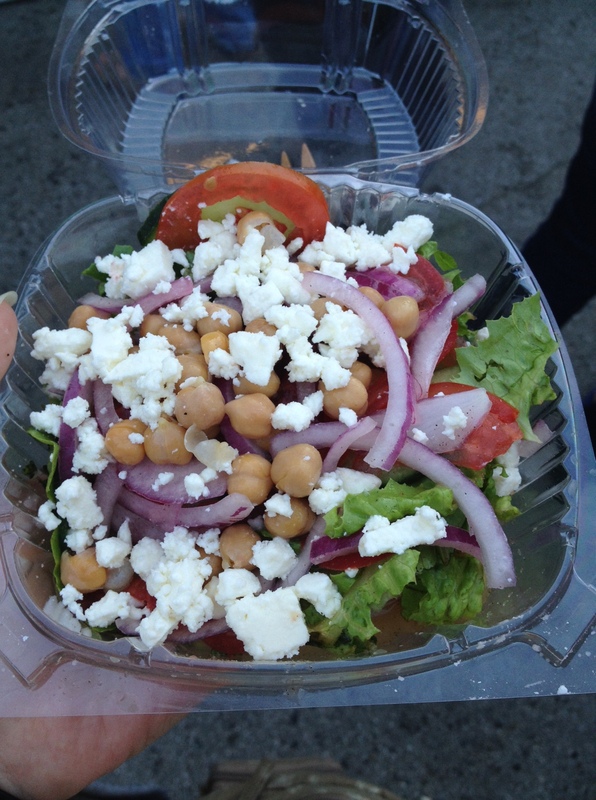 My love affair with salad began before I was a vegetarian, even before I was an adult. I used to be a rather picky eater in my youth, but chicken caesar salads were always a staple. 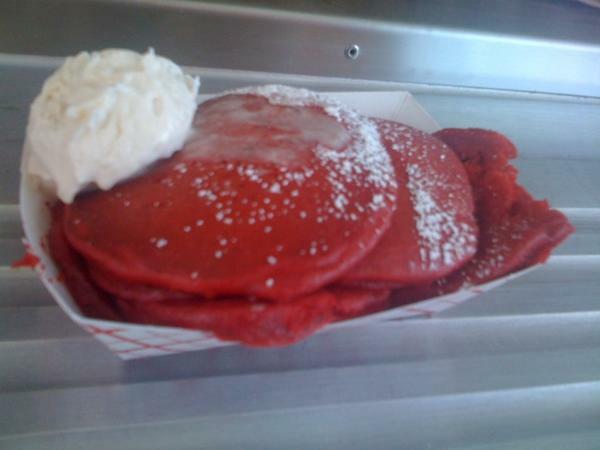 I went to Crepe’n Around first, and while I was waiting in line made the discovery that I had made a major food trucking mistake: I had forgotten to make sure I had enough cash for everything I planned on buying. 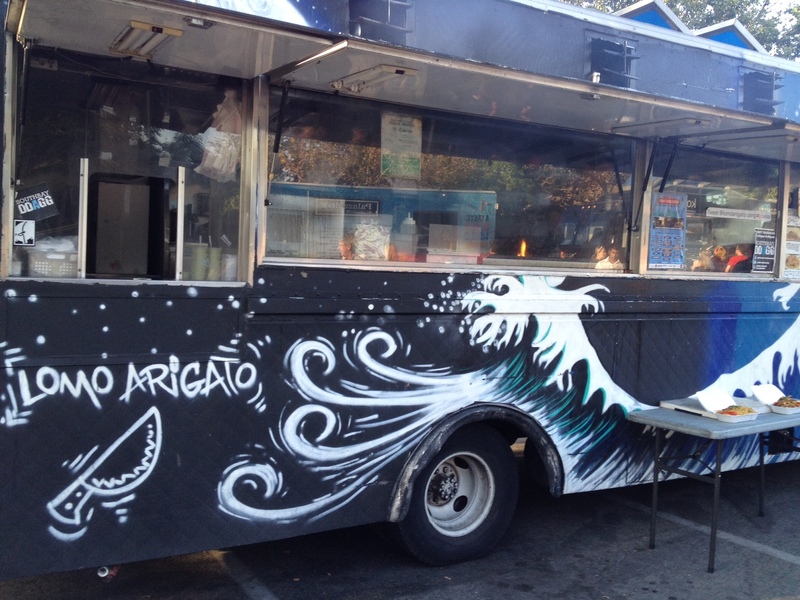 Granted, LA food trucks are more likely to allow credit, but there are often limits for how much you have to spend before you charge, and I feel silly charging a small amount anyway. 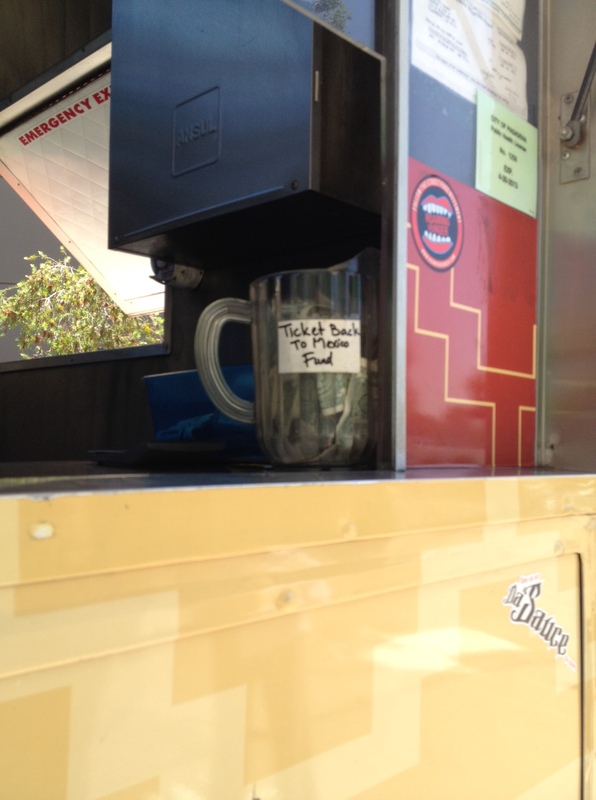 I had ten bucks on me, and a crepe was $7. Now, they have a vegetarian crepe that includes four cheeses, and being lactose intolerant, I didn’t know if I wanted to chance that even with double Lactaid. 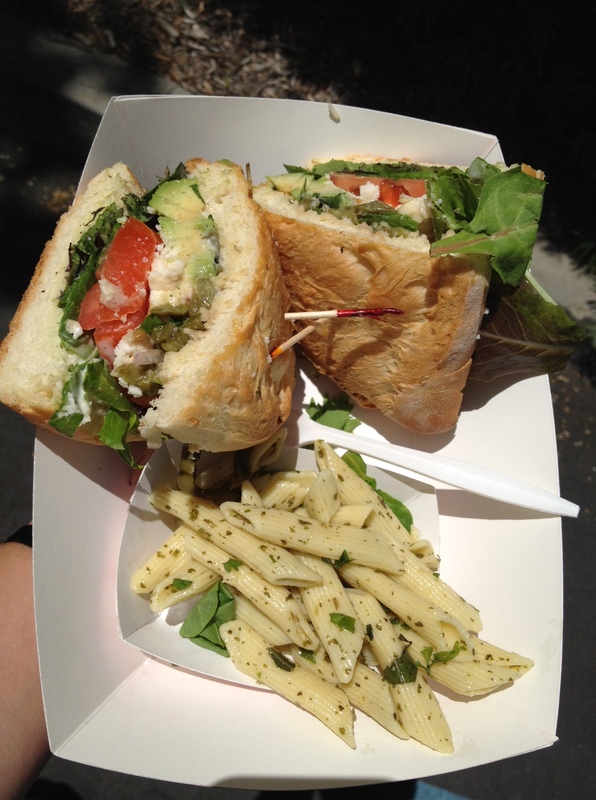 Plus, another one of my love affairs is with pesto, and they had a chicken pesto crepe as well. I asked if it was possible to get the chicken pesto without chicken, and the gentleman working the window paused and then said, “sure!” He proceeded to only charge me $4 for it! This left me with more money for Greenz on Wheelz. I was pleased. I also think he enjoyed saying “chicken no chicken” to the cook and me, so it worked out for all of us 🙂 It didn’t taste like it was missing anything either. 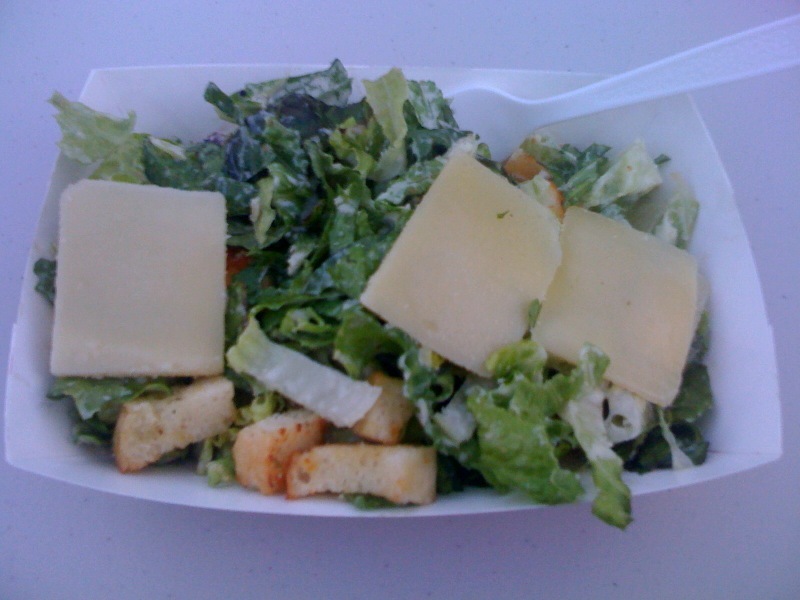 The only salad on the Greenz on Wheelz menu that was $6 or less was the caesar, and I had no problem with that. I got it in a wrap. 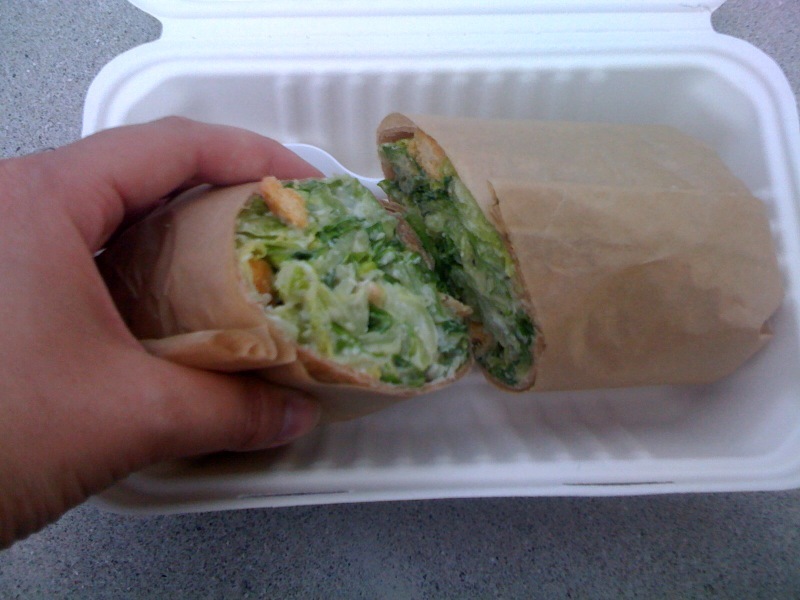 I was afraid that the wrap would mean a loss of croutons, one of my favorite parts of salad, but I was wrong; there were still croutons in the wrap! 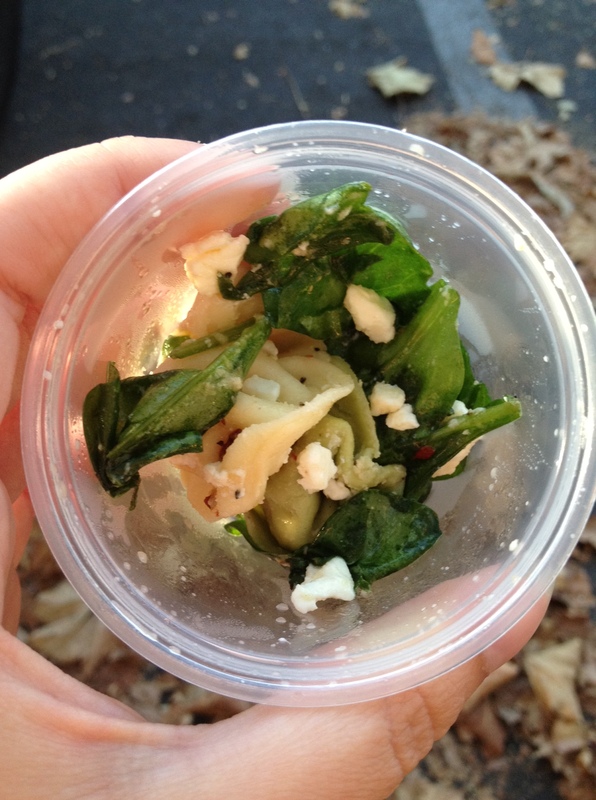 Now, like I said, I used to be quite the caesar salad connoisseur, and this one was definitely a cut above the rest. 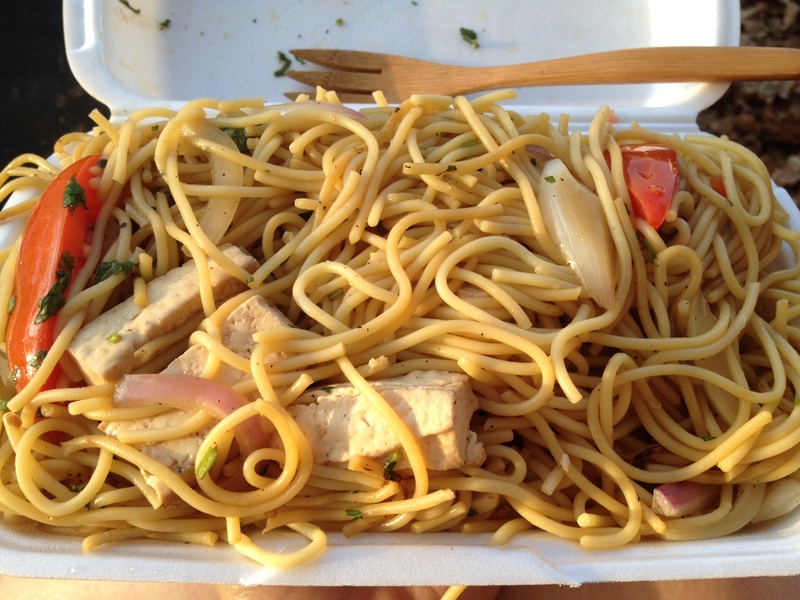 In fact, I was practically full after only eating half of it, so I took the rest to go. 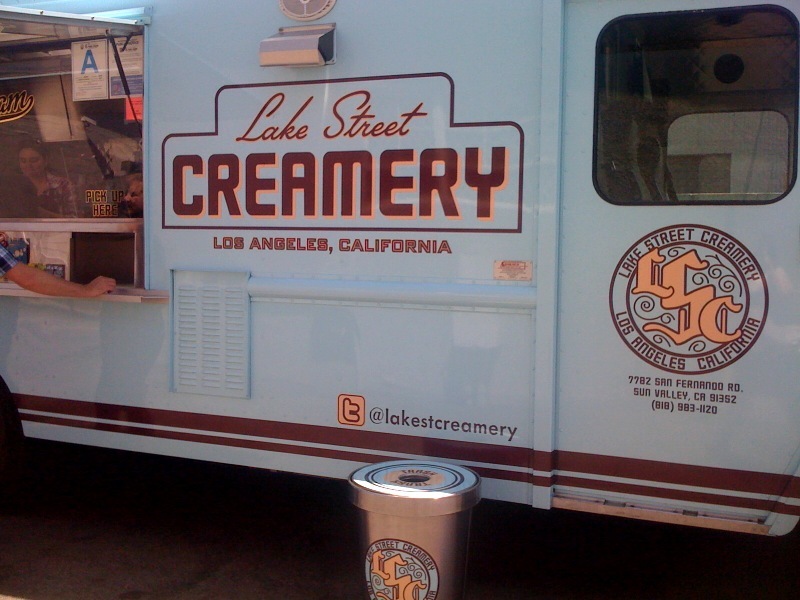 My next stop (after getting some cash back at a store) was also in Burbank at another truck I’d been following since last summer, Lake Street Creamery. 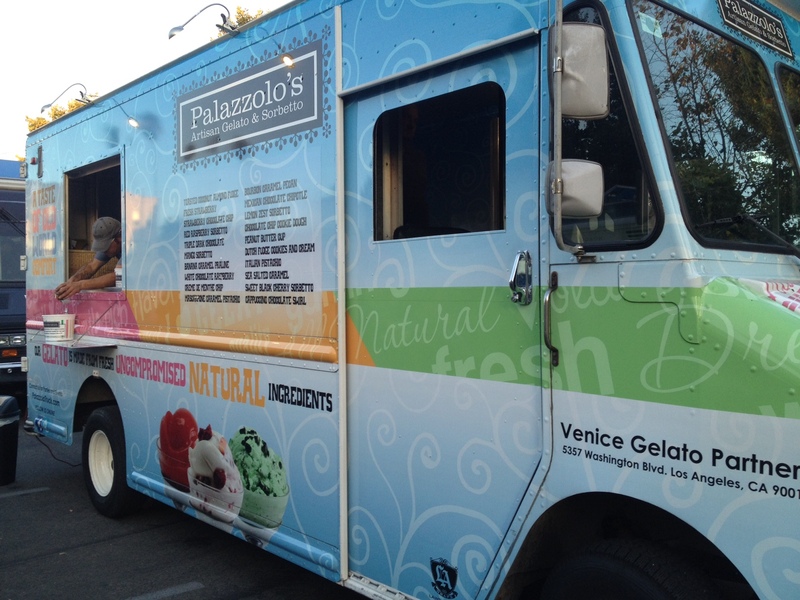 They specialize in out of the ordinary ice cream flavors. 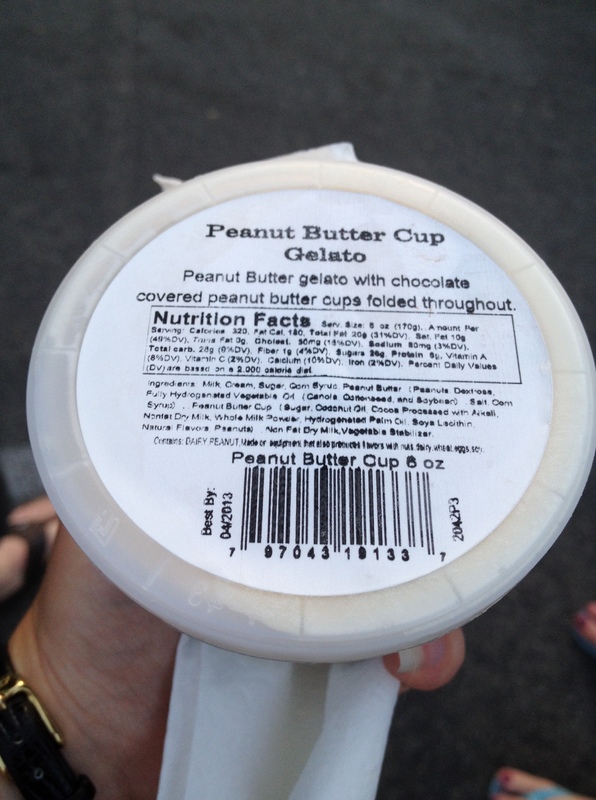 I went with the donut flavor, not knowing what to expect. It ended up tasting exactly like a donut. 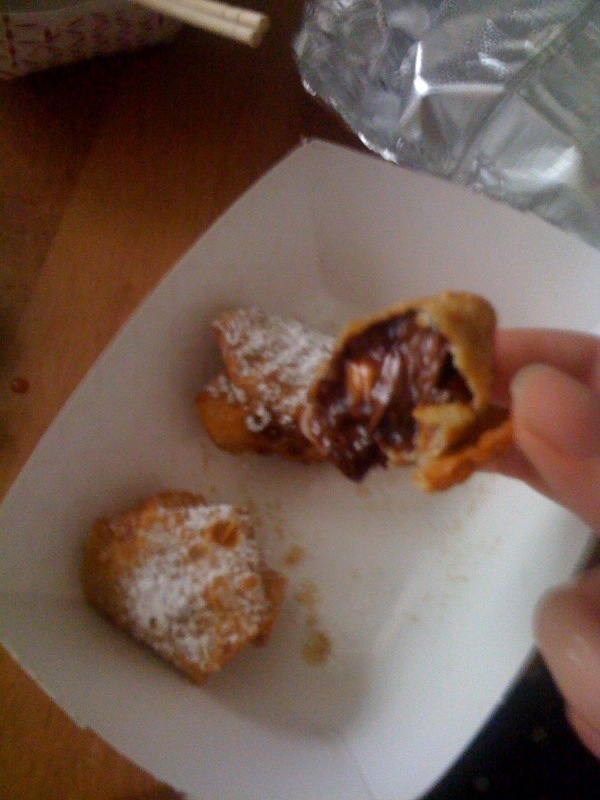 It even had little bits of donut inside. 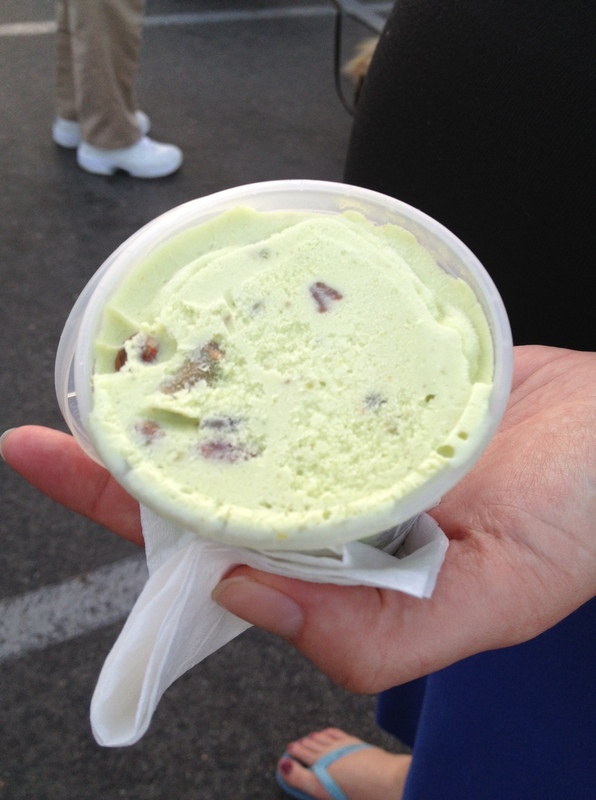 I also enjoyed the waffle cone that came standard. It was slightly burnt, and I’m a big fan of food being slightly burnt. 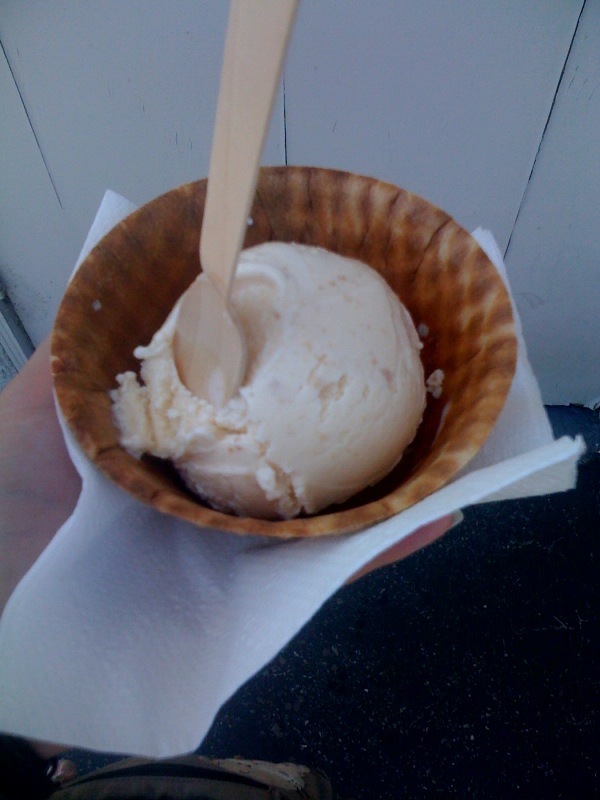 It was also my first time eating ice cream (or maybe anything) with a wooden spoon. 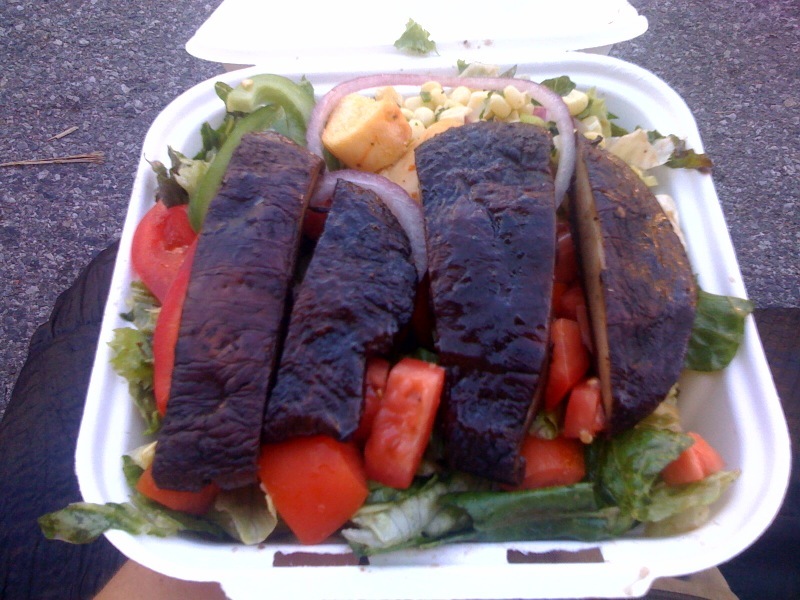 That evening, I had the other half of my caesar wrap for dinner, and it was enough food considering what a big lunch I had. 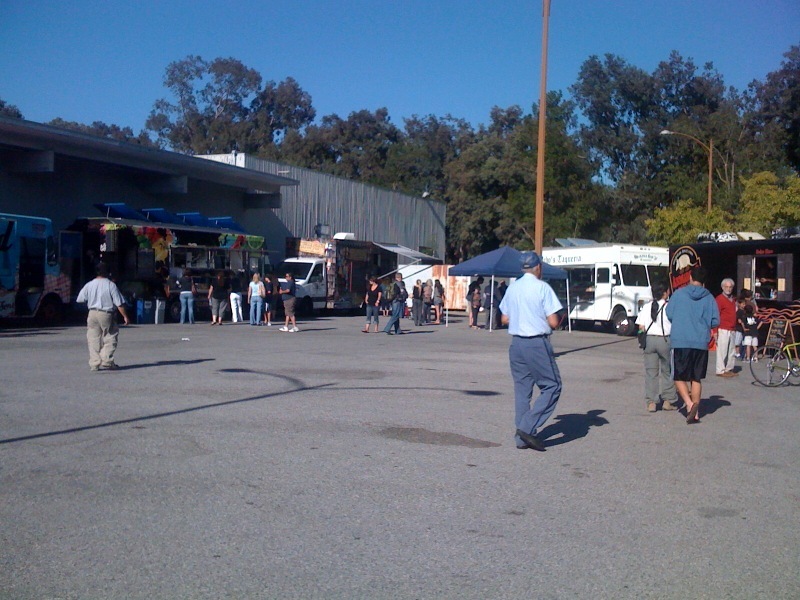 However, I noticed that there was a food truck gathering in Pasadena near the dog park I’ve been frequenting. 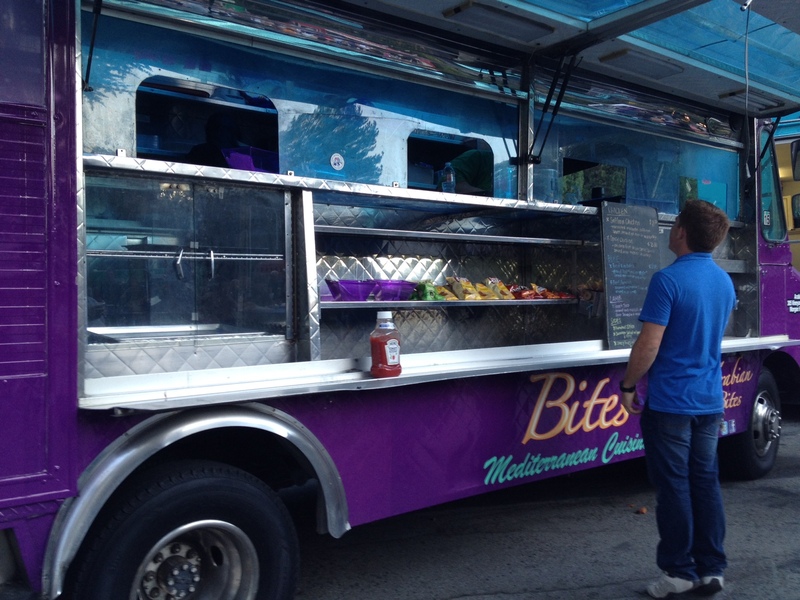 I figured I might as well try to stop by after taking the dog to the park to beat my record of food trucks from last year. 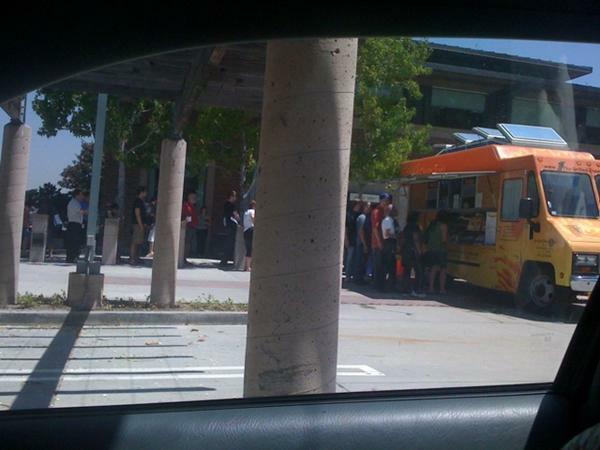 The crowd was larger than I expected with each truck having a line at least a few people deep. 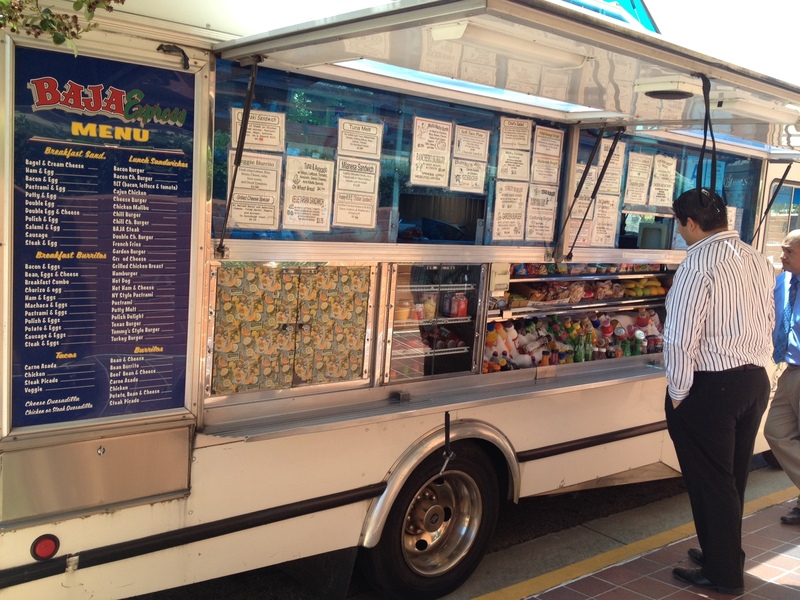 I decided to go for the truck with the shortest line since the dog was waiting patiently in the car. 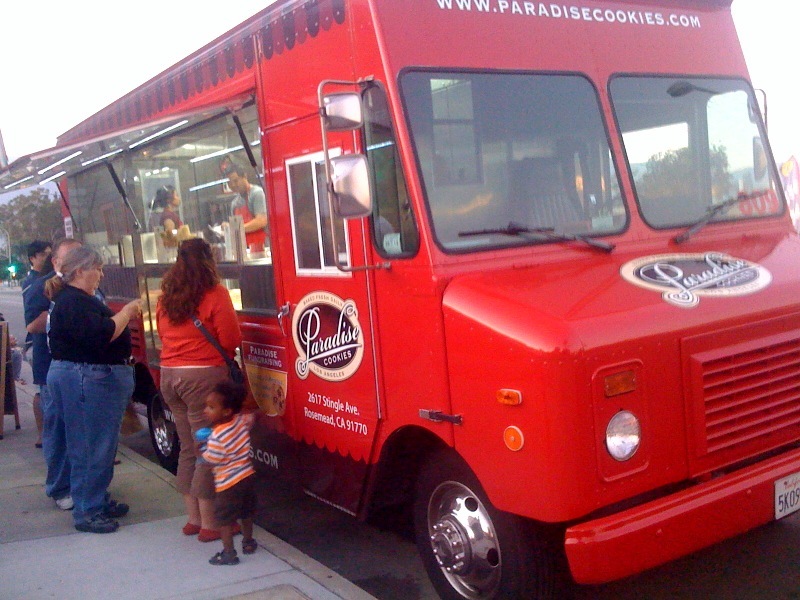 This happened to be The Paradise Cookies Truck. 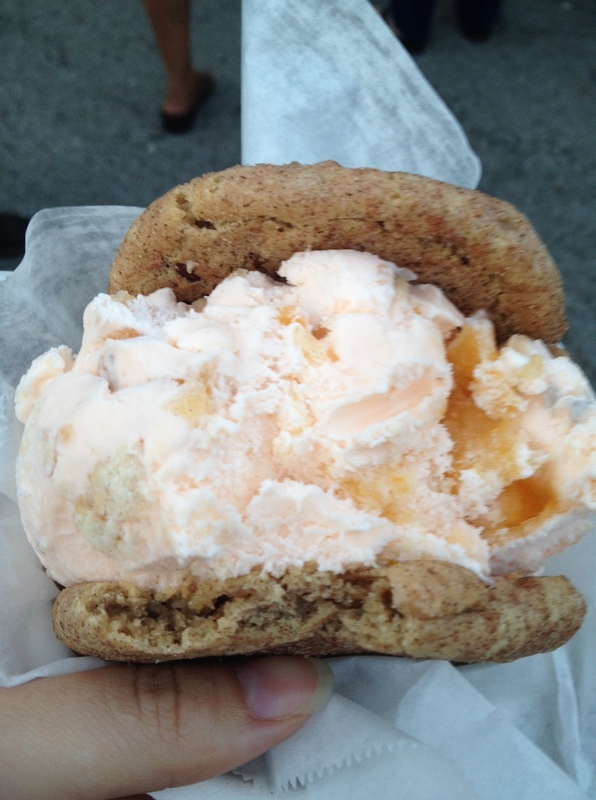 It was convenient since I already had dinner, and I’m a sucker for an ice cream cookie sandwich from a food truck (see also Treatbot and Cool Haus). 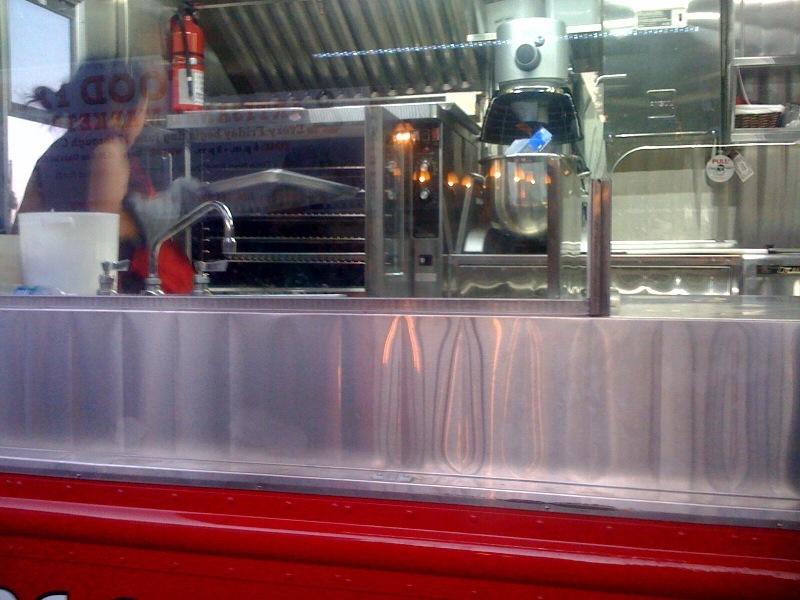 This was the first truck I’ve seen with windows so that you could see what the cooks (or bakers) were doing inside. I found this an interesting touch. 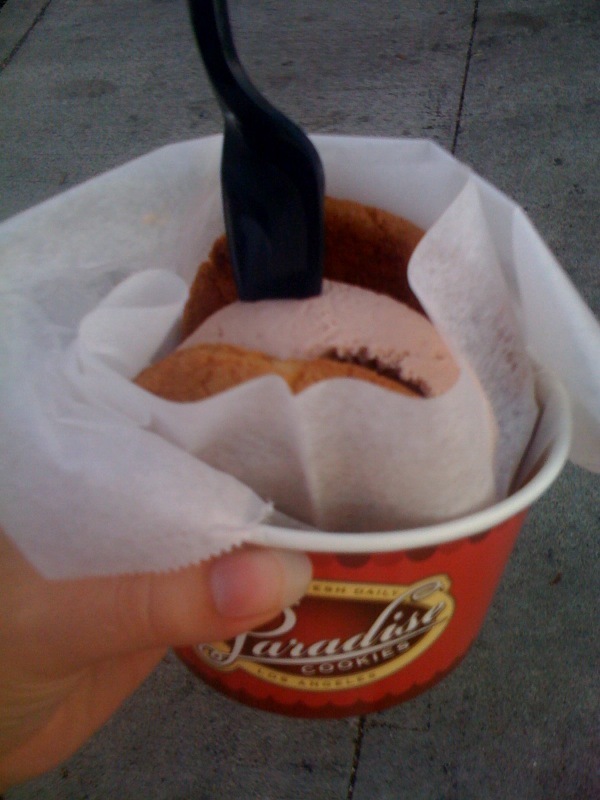 I ordered nutella ice cream on a white chocolate chip cookie. And can I just say? Delicious doesn’t even begin to describe it. The cookies were especially yummy. 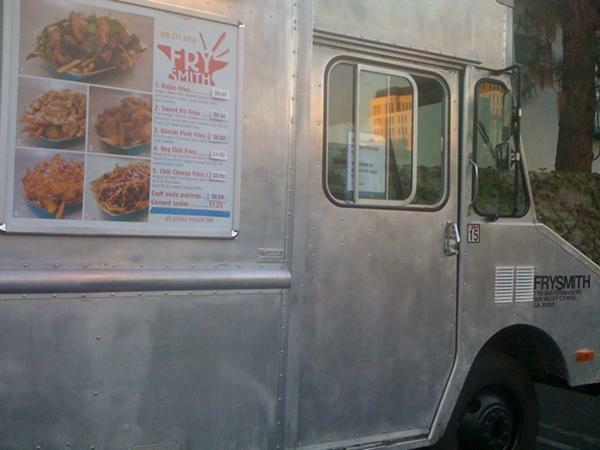 This will probably be my last LA post for this trip, unless I happen to go to another truck tonight. Tomorrow I make the drive back to the bay area. It’s been fun visiting new places with new trucks, but I miss my cat, I miss south bay trucks, and I miss people letting me in when I use my blinker on the freeway. NorCal, I’m coming home! Edit: A fellow vegetarian friend of mine has pointed out to me the fact that most caesar dressing includes an anchovy paste. This is something I knew but had somehow completely forgotten. Can I just express how sad I am about this? Seriously, I know it’s not true of all of them, but there goes my salad staple. 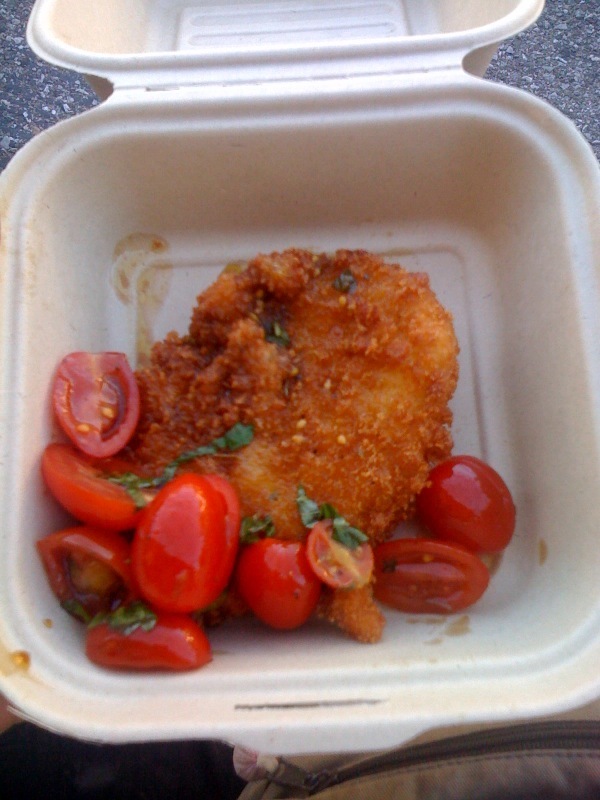 This might be one of my biggest disappointments since becoming a vegetarian, after giving up most kinds of sushi. At least my last caesar salad experience was a good one. 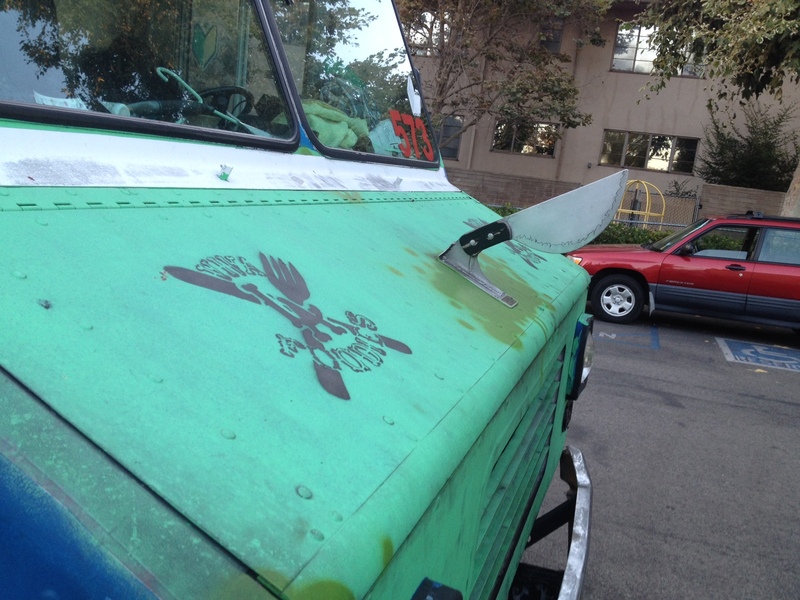 The next leg of my LA food truck trip started on Tuesday afternoon. 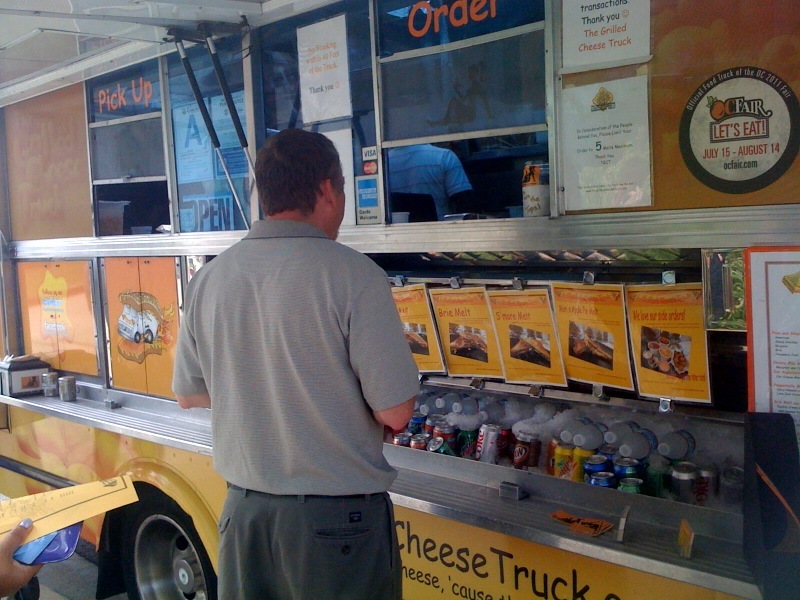 I saw that The Grilled Cheese Truck was going to be in Burbank and jumped at the opportunity to eat at this truck. 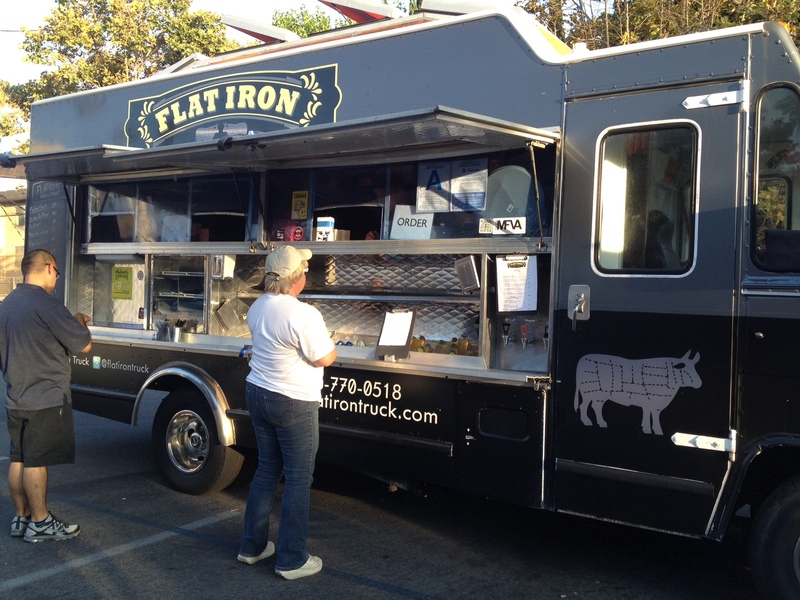 If you’ll recall from my post about my first trip to LA food trucks last year, I had tried to eat at this truck before but had been thwarted by the lengthy line. This time I was determined. I arrived not too long after the truck had, and the line was already about ten people deep. I wasn’t going to let that stop me again though. 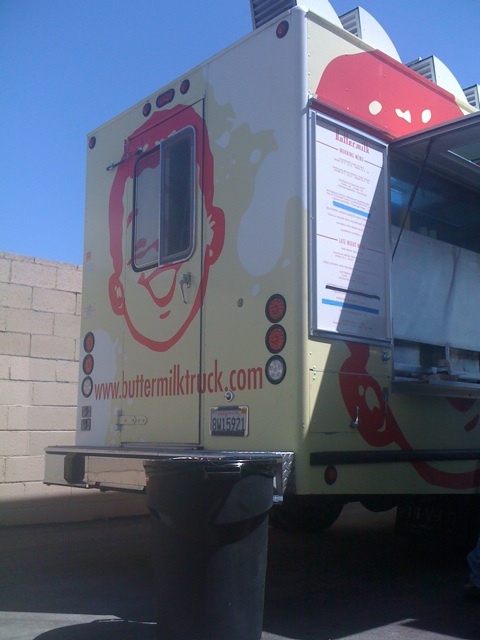 Despite the 97 degree heat (much like my Buttermilk experience in Burbank last year) I braved the line and only ended up waiting about a half hour total for my food. I ordered a veggie melt and a half order of tater tots. Once I got my food and realized it was packed in foil that would keep the heat in, I decided to head back to my sister’s house to eat it. 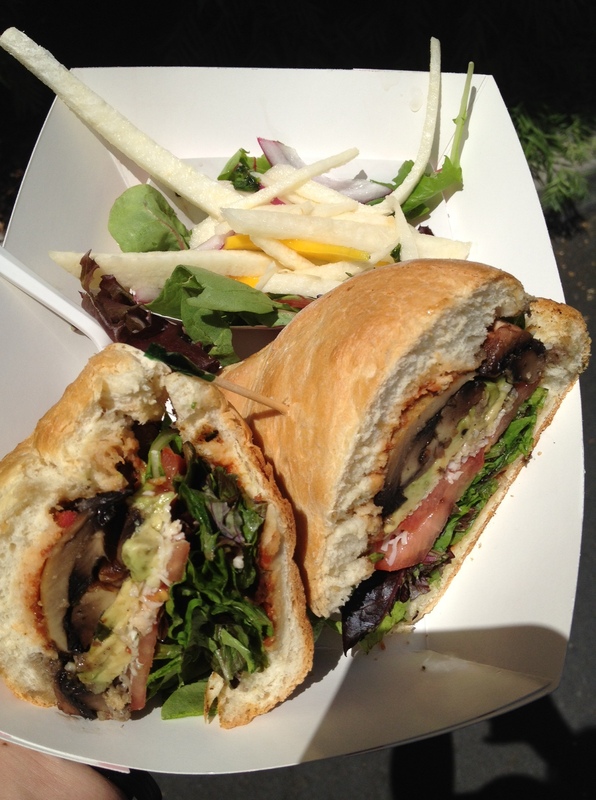 In the time it took to get back to Pasadena, though, the sandwich got a little soggy. It still tasted great though. I took three photos of the tater tots, but they all came out blurry (maybe because of the light reflecting off of the foil?). 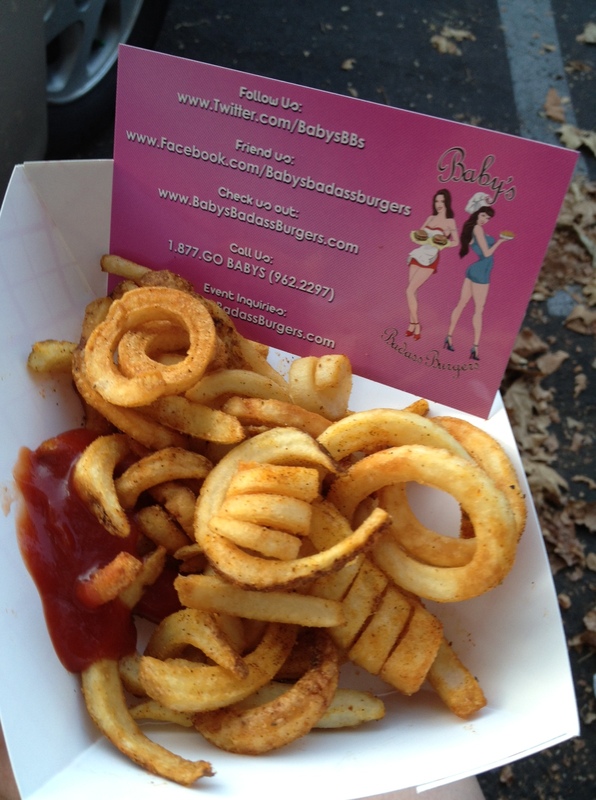 I guarantee you they looked and tasted just as tater tots should though. They were also plentiful for a half order. I’m glad I didn’t go with a full one! 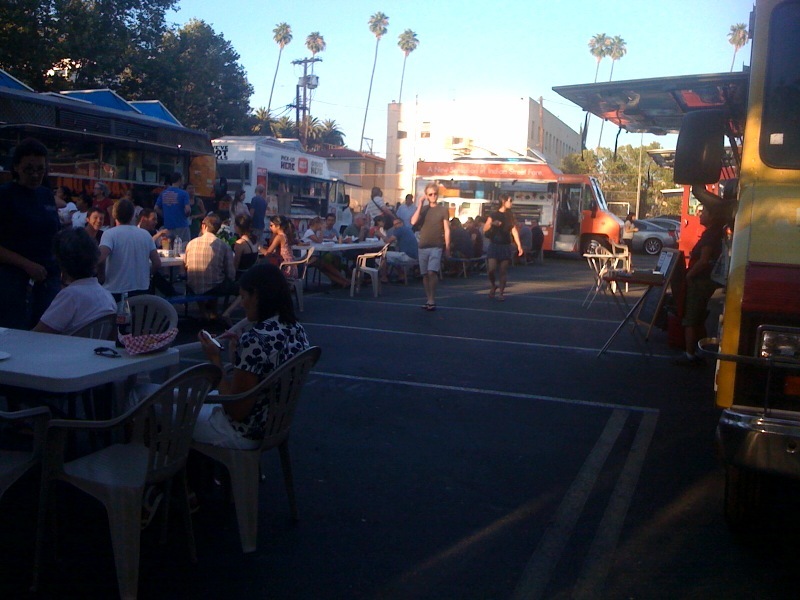 Wednesday night I went to a food truck gathering in Pasadena itself. 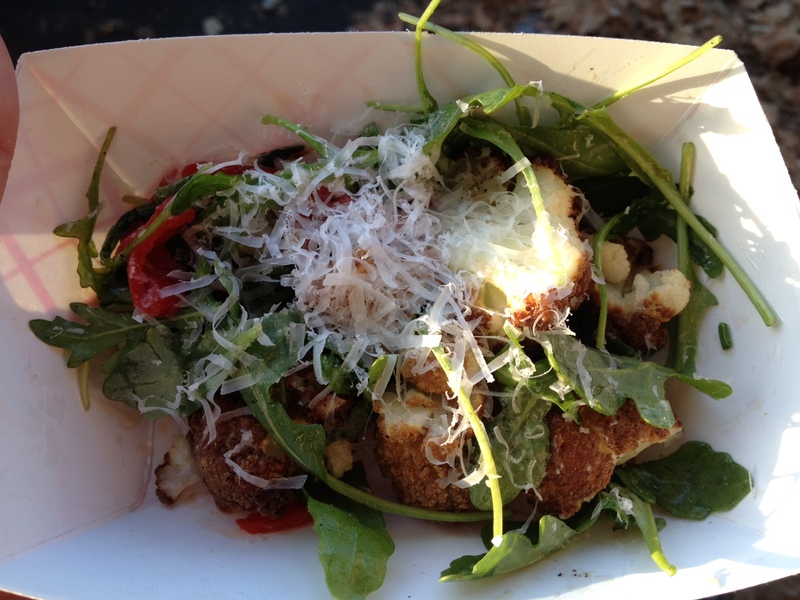 Wheel Food Wednesday takes place every Wednesday at Jones Coffee. 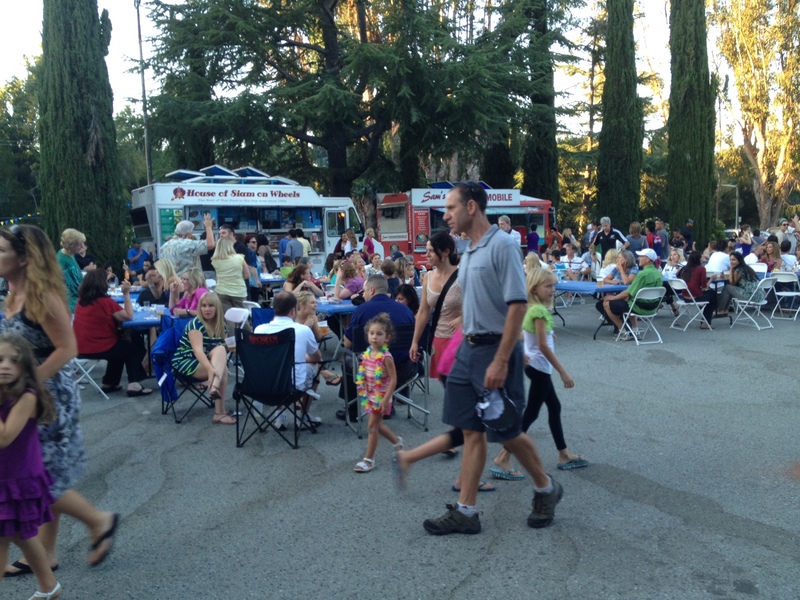 Six trucks were gathered, chairs were set up, and a band was even playing. 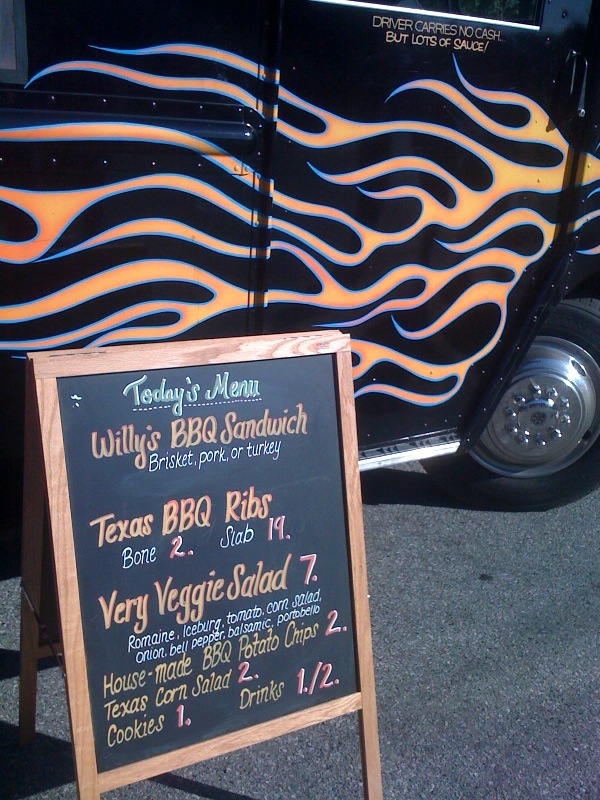 My first stop was the first truck pictured, The India Jones Chow Truck. 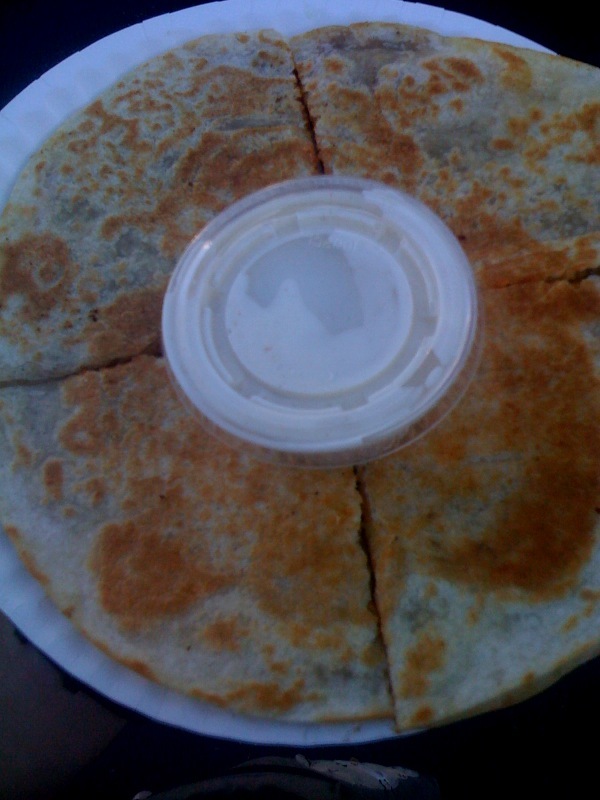 I ordered an aloo paratha, which was sort of like an Indian quesadilla but with potatoes instead of cheese. It was spicy and much more filling than I expected for five dollars. If you’re anything like me, you might be curious about what the inside looks like. I let my curiosity get the best of me and took a photo in the process. 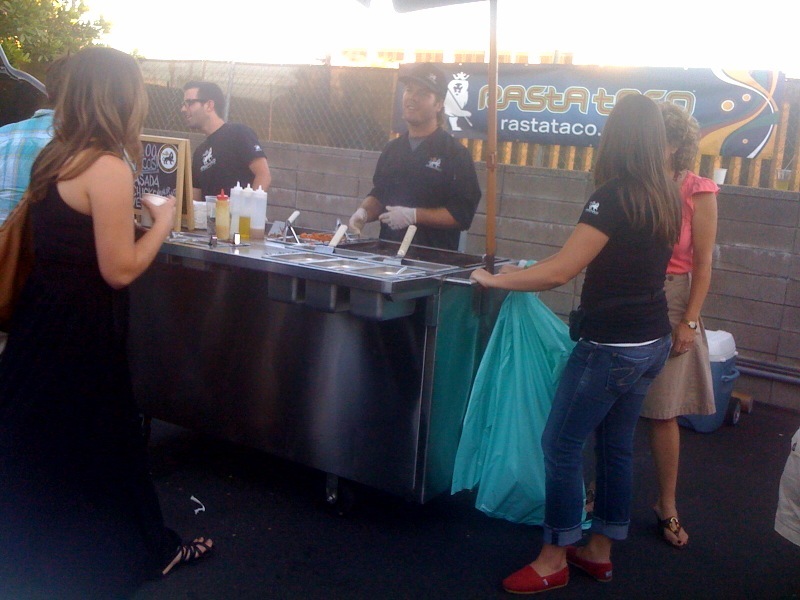 Since I was already pretty full, my next stop was for just one taco at Rasta Taco. 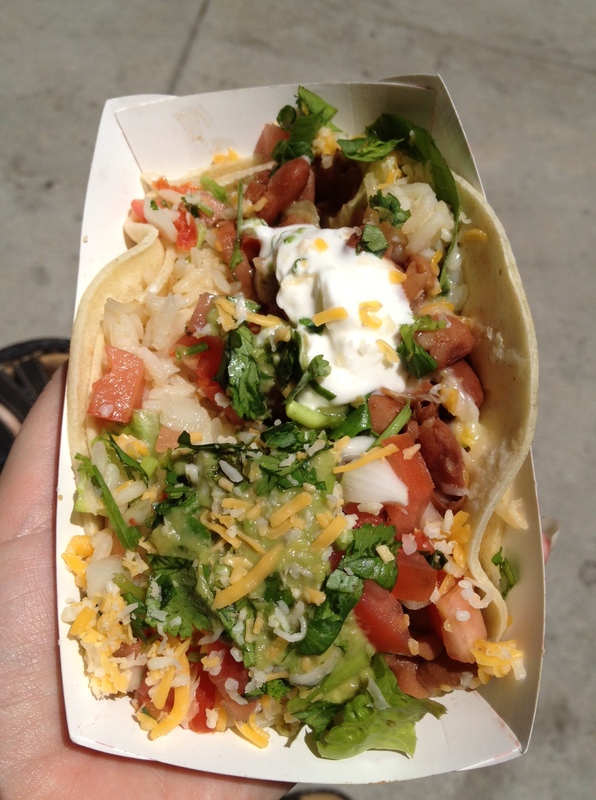 I was impressed by the price of only one dollar for a taco, definitely the cheapest I’ve seen. 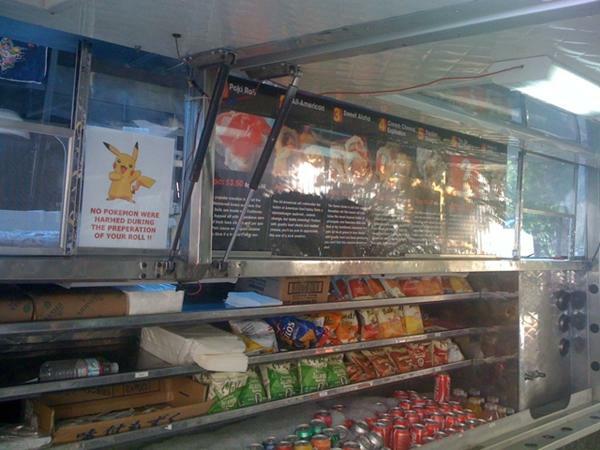 They’re more of a cart than a truck, and they have a spread of toppings you can add to your tacos. 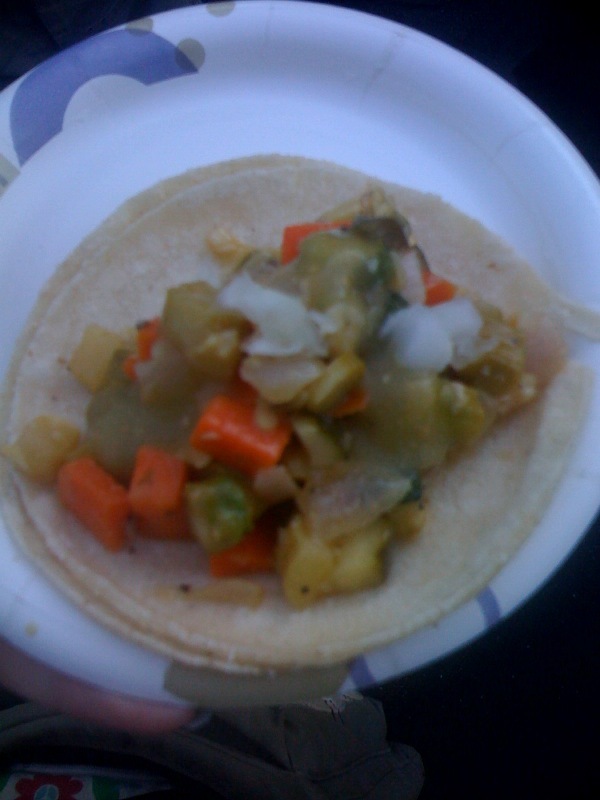 I, of course, went for the veggie taco. 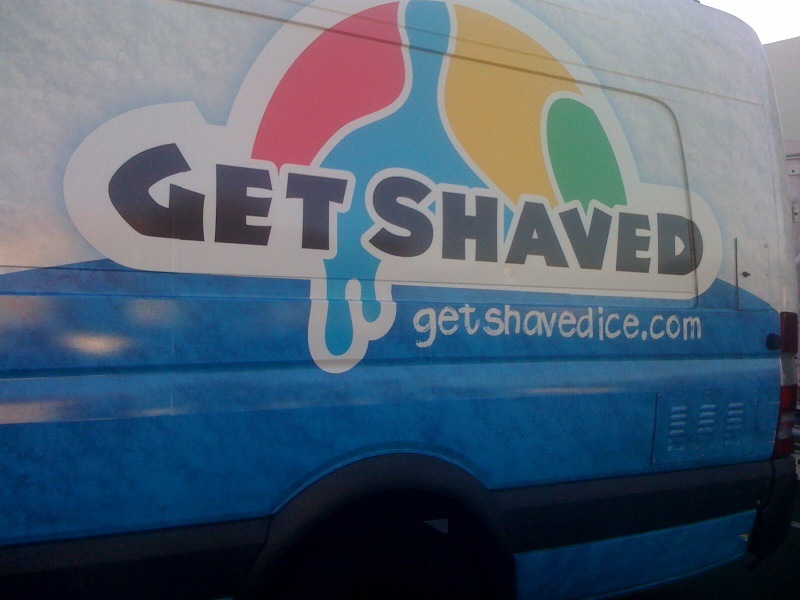 My final stop was a truck I’ve been tracking since last summer and couldn’t wait to try, Get Shaved. I was pleased to see they allowed three flavors for each order regardless of size. I just got a small, but it was much bigger than I expected. They do have a smaller size, called a UFO (because of how it’s shaped). The flavors I got were guava, pineapple, and watermelon. I found the guava and pineapple to be tasty, but the watermelon was lacking in flavor. 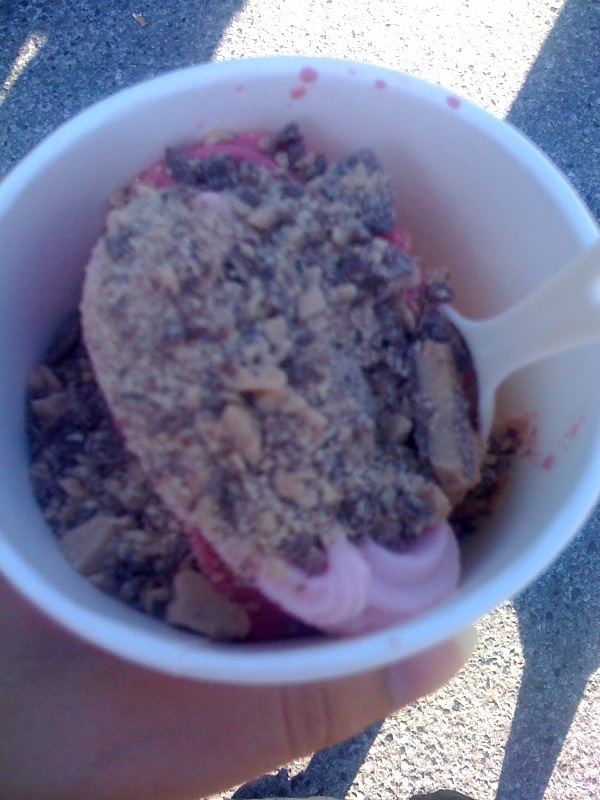 It’s worth noting that I was definitely served more of the flavor in the middle, which happened to be the pineapple. I didn’t really mind, but I wonder if this is standard or depends upon who’s making it. If it’s standard, I could totally see myself requesting a specific flavor for the middle. 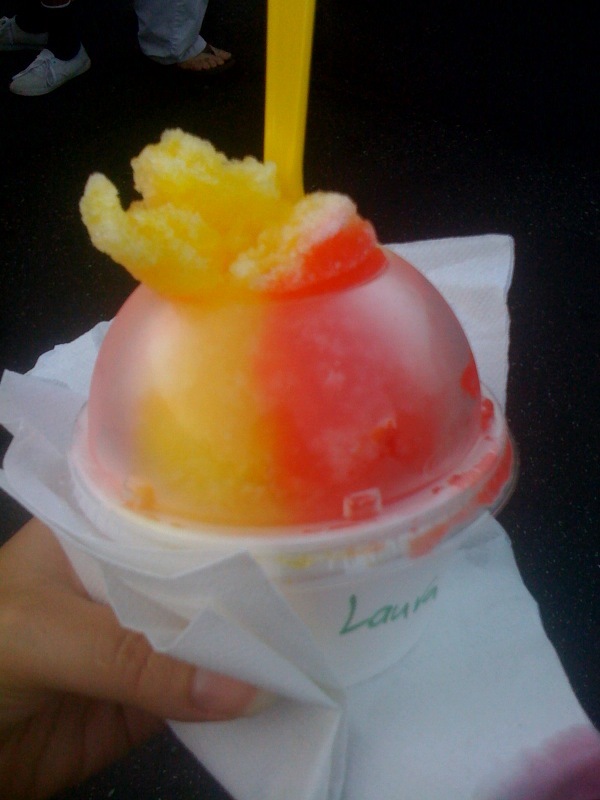 I know I mentioned this on twitter, but I really wish there was a shaved ice truck in the south bay. It’s just so refreshing on a summer day! 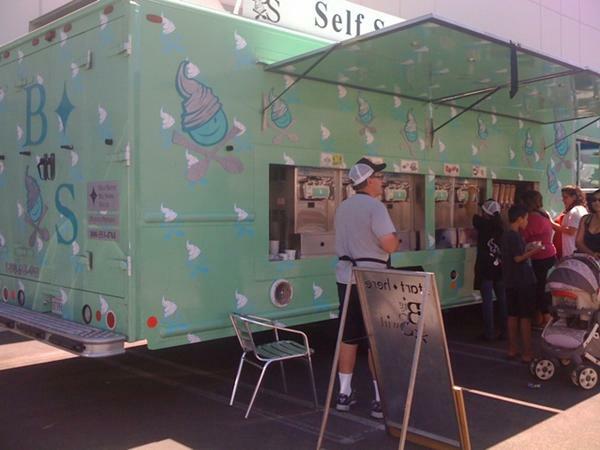 It’s also worth noting that one of the trucks at the event wasn’t even a food truck; it was a fashion truck called Le Fashion Truck! I didn’t even know these existed. 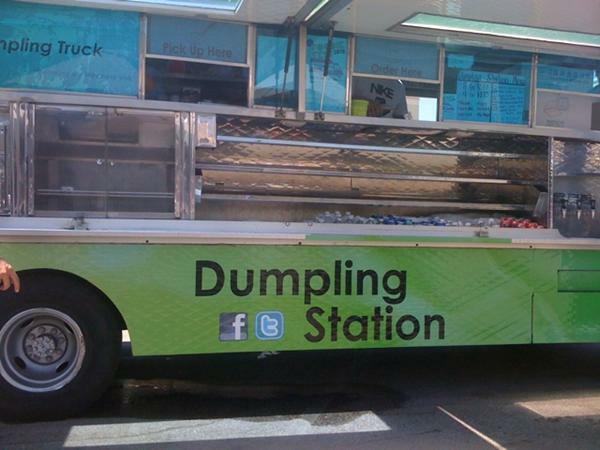 For all I know, it could be the only one of its kind (the website claims it’s the first), but I’m interested to see if this trend catches on in the same way food trucks have. I’ve been in LA since Friday, but I didn’t have the best luck finding trucks until Monday. Saturday I tried to catch a truck but got lost and showed up just as the truck was pulling away. I was pretty disappointed, but it was a truck I had been to before anyway. 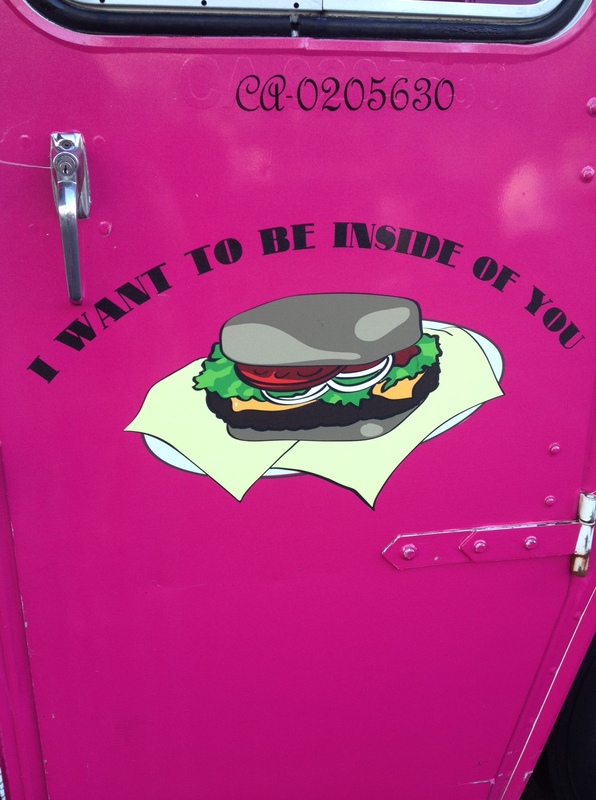 Yesterday one of the trucks was in Pasadena, where I’m staying, for lunch. 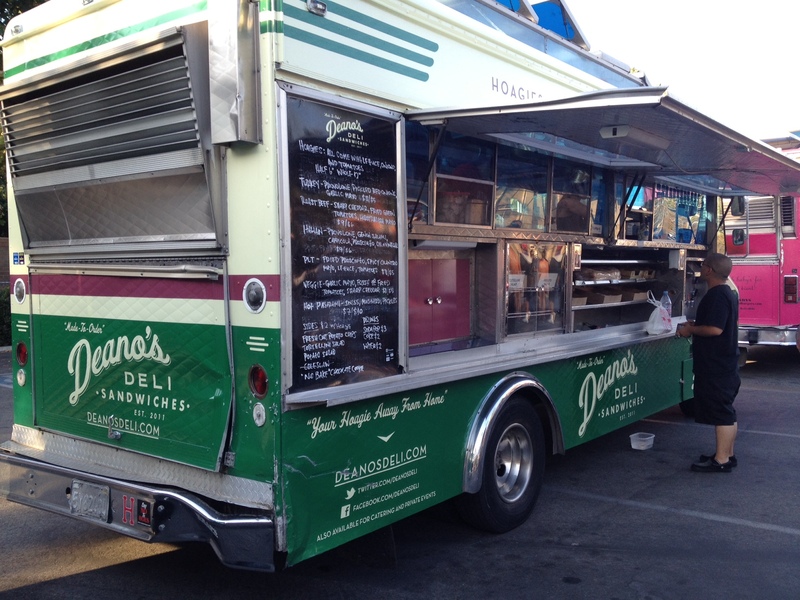 Although it was on the other side of town and I had already eaten, I was excited for my first truck experience since returning to LA. 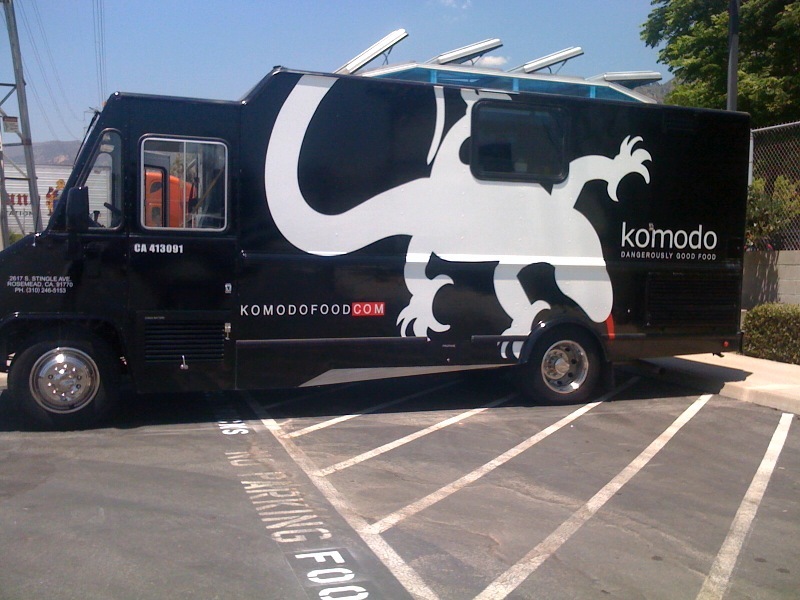 The Komodo Truck was located next to an office building that apparently housed food trucks so often they felt the need to designate part of their parking lot for them. 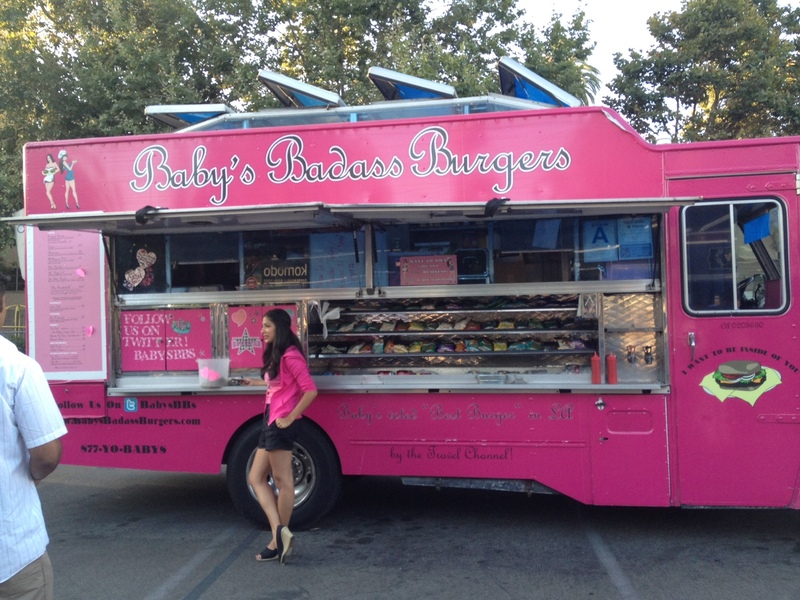 This is definitely something I have yet to see in the south bay! 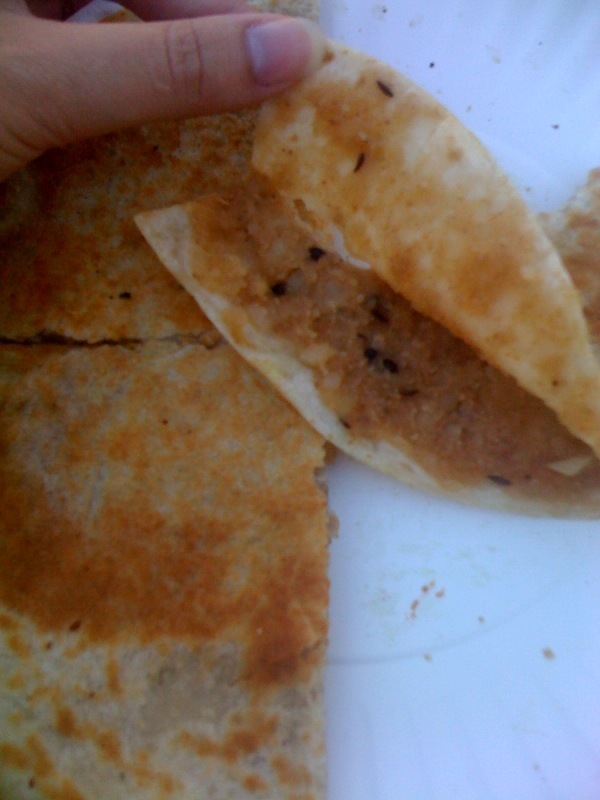 Since I had already eaten, I just got one taco, their soi. 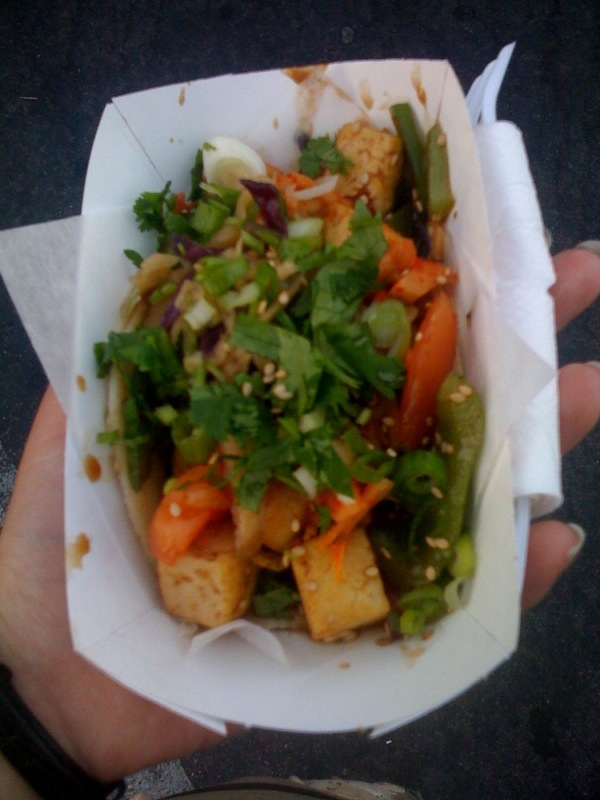 I loved the little pieces of tofu on it. 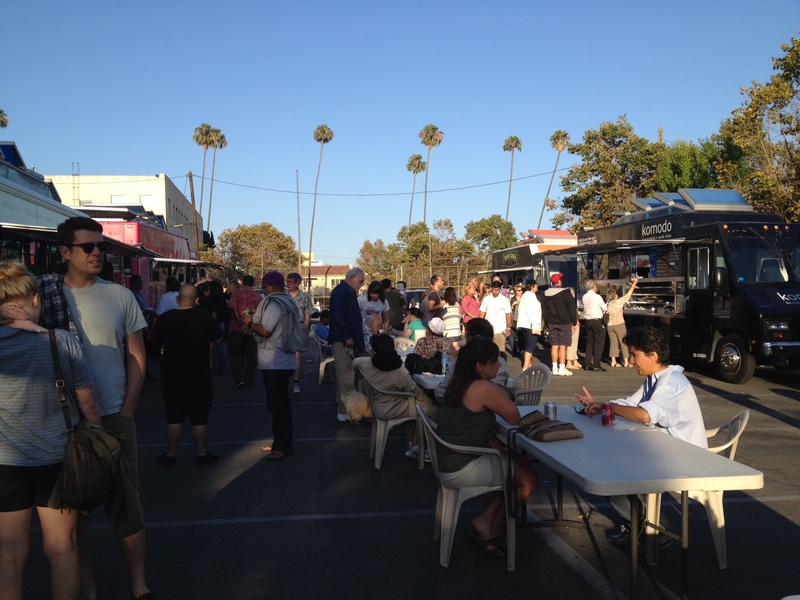 Definitely a worthy welcome back to LA food trucks. 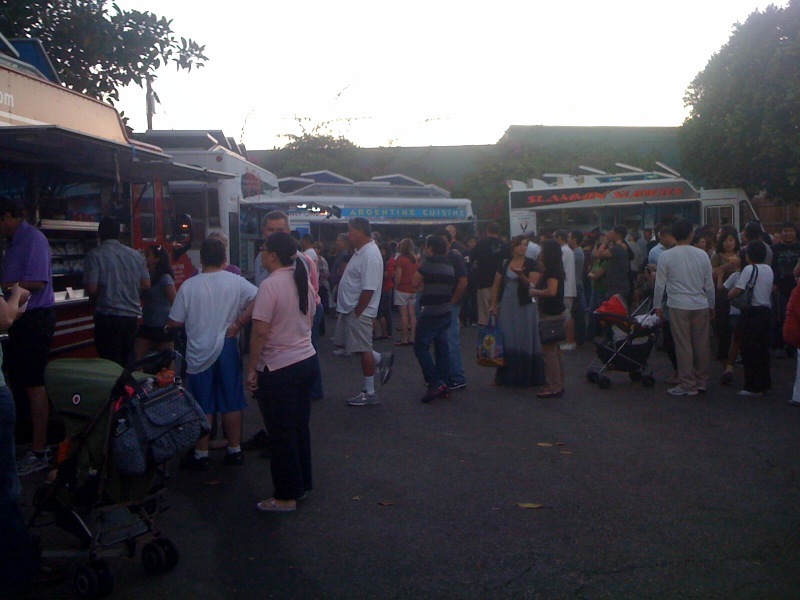 Monday night, thanks to twitter, I sought out a food truck gathering in Los Feliz called Din Din a Go Go. I immediately fell in love with the name and was excited to go to a Monday night festival since all the tweets about Edgewood Eats were making me home-food-truck-sick. I invited Amanda and Andy from Two Boos Who Eat to meet up with me there. We’ve been online friends for about eight years, and I first met Amanda in person last year. This was my first time meeting her husband despite knowing him online for just as long! Since both of them are also teachers and obsessed with food blogging we had lots to chat about. Please forgive the crappy lighting, but you get an idea of what the spread looked like. 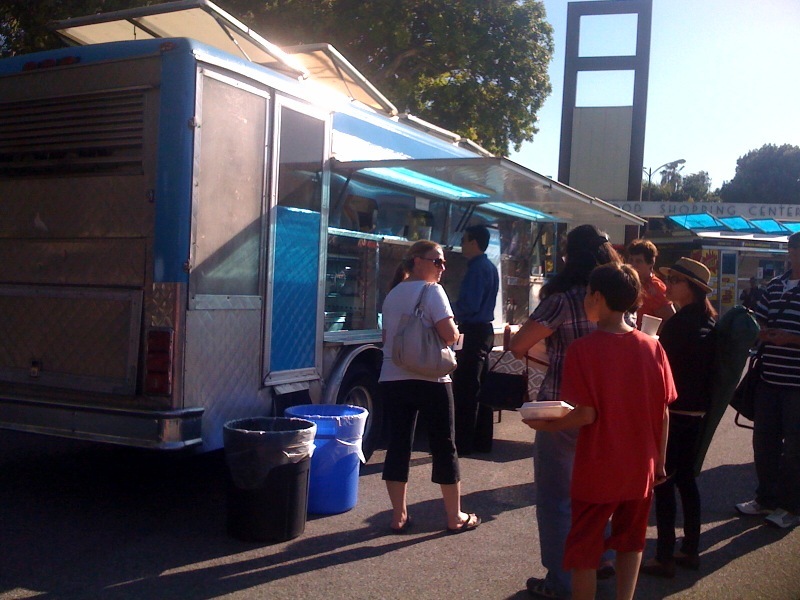 There were about eight trucks and, surprisingly to a bay area food truck lover, seating! 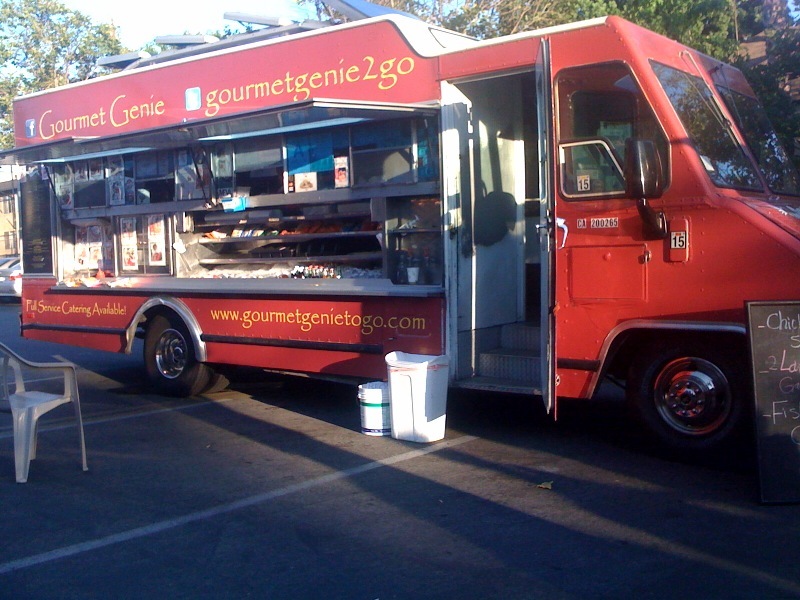 The first truck I visited (before Amanda and Andy had even arrived) was The Gourmet Genie truck for some falafel. 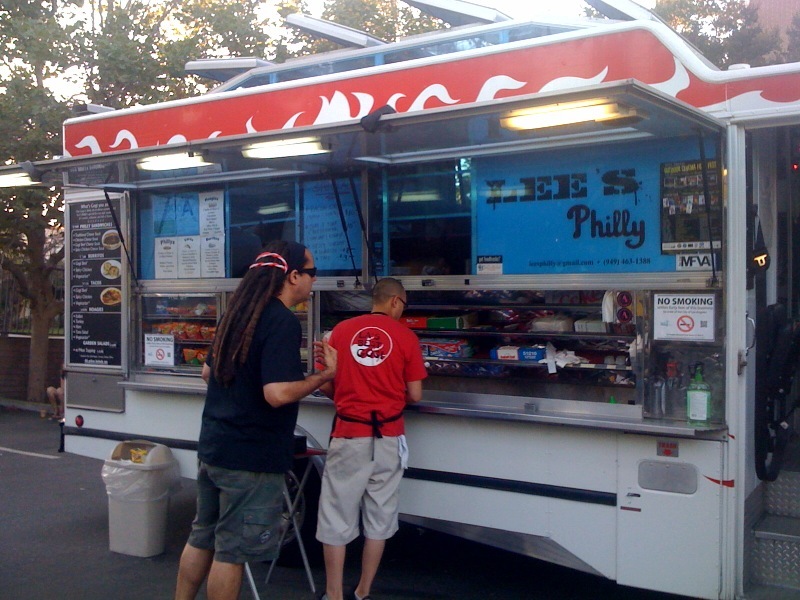 My next stop was Lee’s Philly Truck, which specializes in its cheese steaks. 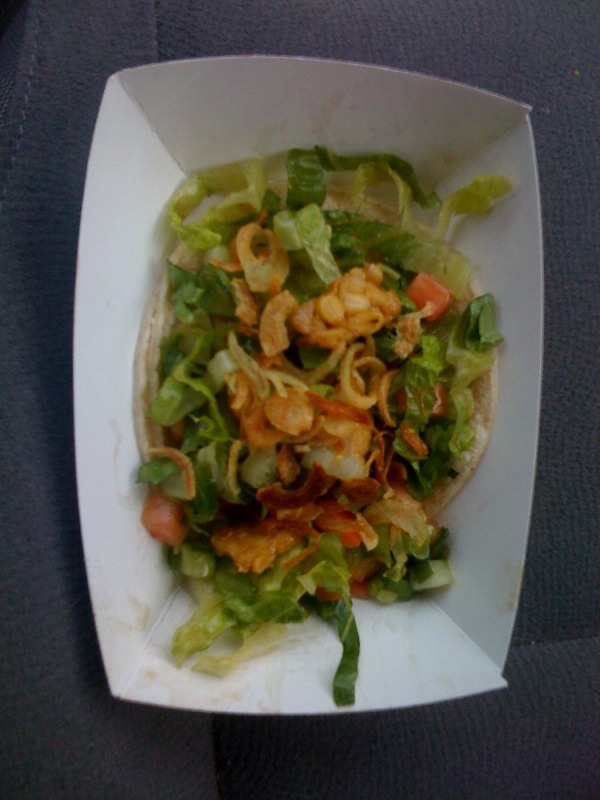 I admit I felt a little silly just getting a taco at a cheese steak truck, but it’s hard for me to resist a good veggie taco. This one was no exception. 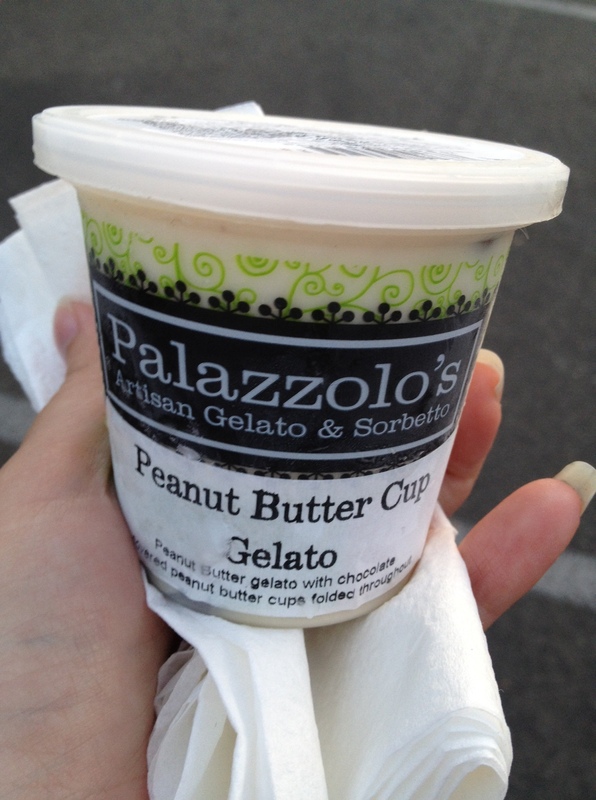 As Amanda would say, YUMZILLA! 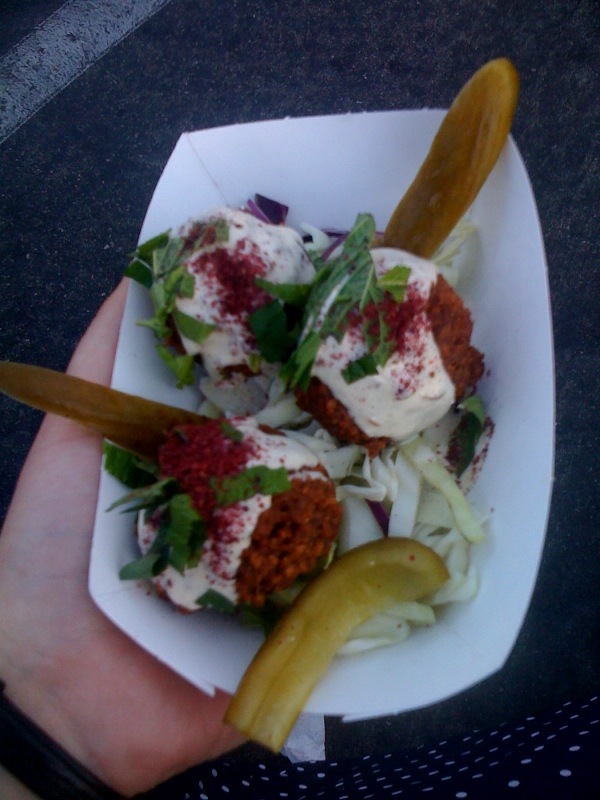 The falafel and taco were more filling than I expected, but I wanted to try one more truck. 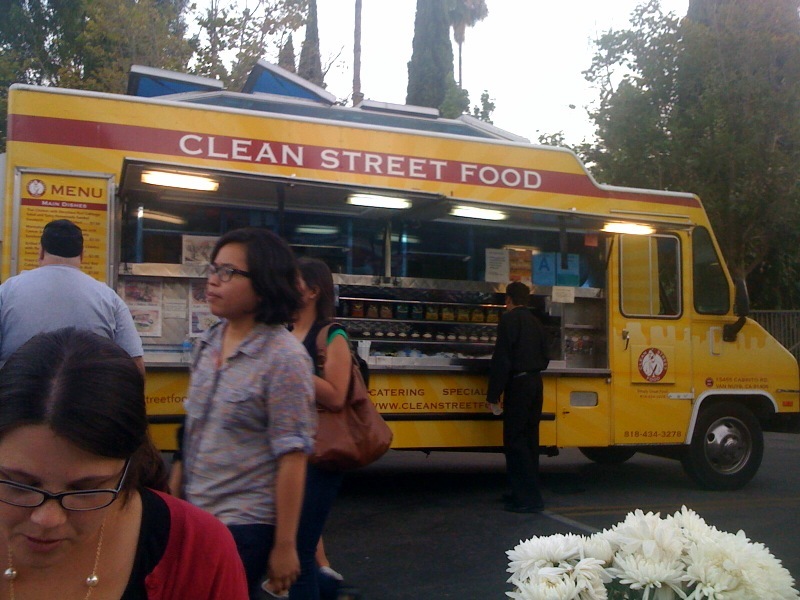 I ventured over to The Clean Street Food Truck. 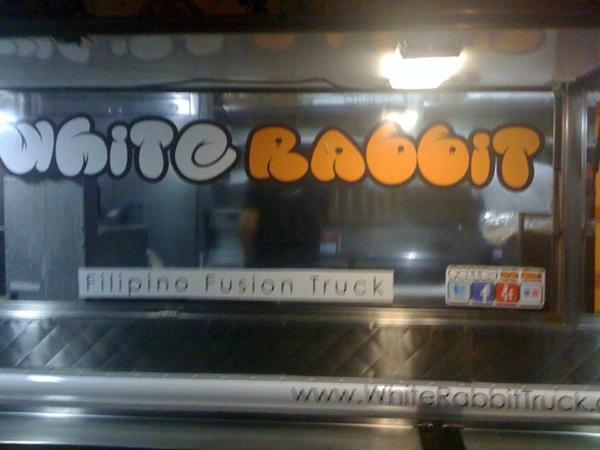 I found this an interesting name for a food truck. 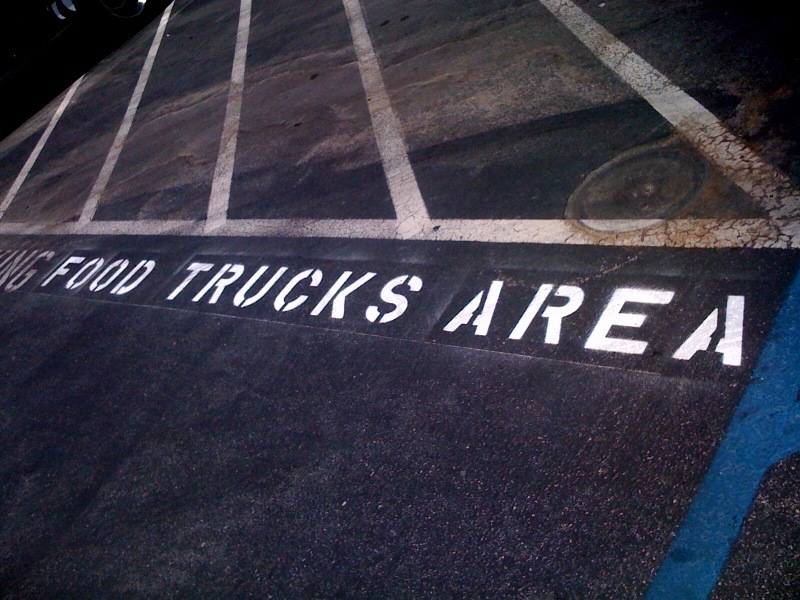 I mean, we hope all the food trucks are clean, right? 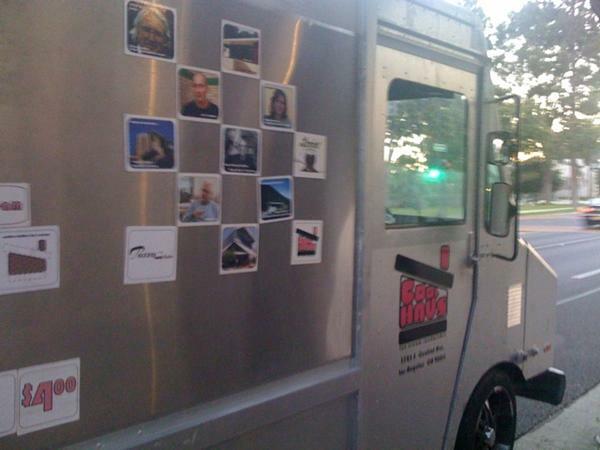 Amanda unknowingly made a cameo in the bottom left corner of my photo for this truck. I wanted something light, so I got a half caesar salad. 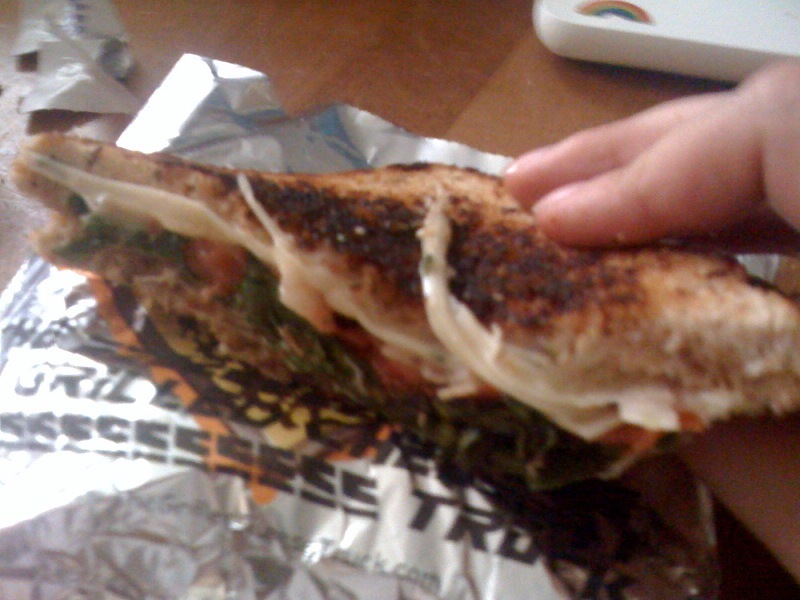 It was topped with big hunks of cheese and flavorful dressing. I was surprised by its size for a mere three dollars.